Our rates are in Canadian dollars, but the rates table defaults to showing all Canadian property's rates in US dollars, for an accurate quote please email as the 'instant quote' function does not update correctly. A vacation townhouse in one of Whistler's premier ski-in/ski-out developments, which we have made into a 5 STAR quality vacation retreat. Located at the top of the Benchlands in Whistler Blackcomb, this is a true ski-in location. Ski-in right to our door off the ski run 'Home Run' and ski out across the street directly under the Wizard Express. Located at the top of Painted Cliff road, you will find us next to the highest development on Blackcomb Mountain. This is our personal vacation home, so you'll enjoy extra amenities, as we've furnished this home for our own comfort and love sharing with our guests. Arrowhead Point is a family orientated complex and there is zero tolerance for disrespectful behaviour that affects the peace and enjoyment of our neighbours. Our three bedroom townhome in Arrowhead Point provided us with enough room for our family and friends to comfortably join us in Whistler. 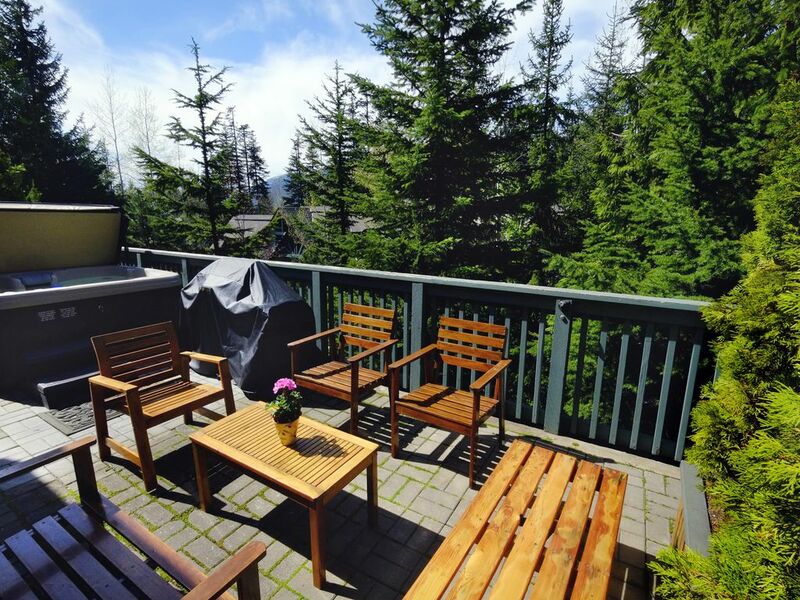 The location was perfect, an end unit, with a private entrance, ski in/out location, as high up on Blackcomb as one can get, yet close enough to the village to walk, ride a bike, or take the shuttle, not to mention the private hot tub on our own patio. Plus, the privacy, peace and quiet that we experience cannot be beat. What more could we have wanted! Free, secure underground parking for 1 car, 6 visitor's spots available on a first come, first served basis. Pull out Queen sofa bed, DVD's, games and books to borrow. Small balcony off the master bedroom. Bike lock up in the underground garage. Ski-in access to our complex ends right outside our front door. Large private hot tub on the large deck. Great location. Spacious and clean. Plenty of room for 6 adults. Great property quick walk to Blackcomb gondola lift. Well kept, spacious with room for 6 adults. Hot tub was perfect after a long day of skiing. Right on free bus route 5 to get into village. We really enjoyed our stay at this place!! It is amazing, practical and cozy! Everything we expected and more!! The kids were super happy and enjoyed the jacuzzi every day! We are definitely planning on going back to Whistler next year and we would LOVE to stay there again! The condo is very comfortable and nicely appointed. The entry has a great set up for a ski vacation, separate from the living area with plenty of hooks for gear/jackets, ski storage and a boot warmer. The kitchen is well equipped with plenty of glasses and dishes not just the minimal amount. The bus stop is very convenient. I have rented many different times from VRBO and Anita was best to work with. Very quick replies with lots information on any questions I asked. My only negative comment about the unit is the ski-in aspect. It is a ski-in unit but skiers using the trail should be very comfortable on narrow icy trails as it can be a bit tricky to navigate. Fresh snow would have made it better but still not easy. Walking back from ski-out location is a better option for less experienced skiers and is a short easy walk. This would not deter me from renting the unit again. I have been to WB four times and this is by far the best unit I have rented. We loved our stay at this place. The kitchen was brilliant and had everything we needed and more. Everything just worked fine and the spa was a great treat after a full days skiing on the best mountains I know of. It was only a short work to the ski out and the shuttle bus made it very easy to get around. The heated floors and fire place kept the place very comfortable day and night. Anita was fantastic and a great help from the first contact with almost immediate replies to any questions we had. If we are lucky enough to get back to WB this place would be our first choice. This townhome is well appointed and cozy. Lots of indoor space for everyone and so close to the free shuttle into the village. We loved that it was at the end of the row of townhomes, giving our kids an outdoor space to play in while relaxing at our home base. This is the most convenient property we have ever stayed in for ski in ski out. The condo has everything you would want to stay in and relax after a fabulous day on the slopes buy why would you do that when it is so close to wonderful restaurants and shops. A great place, would stay here again in a minute. Whistler - think Disneyland only with good food and snow. Besides the great winter sports and fantastic Whistler Village, it is also a great summer destination, with the largest mountain bike park in North America, several great lakes for water sports, white water rafting, and three championship golf courses. Golf: Great golf courses just a 2 minute drive from our home. Before we can welcome you to our home, we'd like to know a bit more about your group. For a quick approval of your booking request please share details about your group dynamic (friends, couples, family etc) and ages. 25% DUE AT TIME OF BOOKING; 75% DUE 45 DAYS PRIOR TO ARRIVAL. Full amount is due if booked less than 45 days prior to arrival date. Our rates are in Canadian Dollars. Must be at least 25 years old to rent our property(proof of ID required).Until confirmed, rates are subject to change; we compare our prices to similar properties prior to providing a quote. Longer stays are always welcome and are discounted. Shorter than minimum stays may be considered. Partygoers need not inquire. Arrowhead Point is a family orientated complex and there is zero tolerance for disrespectful behaviour that affects the peace and enjoyment of our neighbours. Party goers need not inquire.